The Petroleum Ministry has moved a proposal to reduce excise duty on the two fuels as part of the pre-Budget memorandum submitted to the Finance Ministry. The government may go in for an excise duty cut on petrol and diesel as prices of the two fuels have touched a record high. According to reliable sources the Petroleum Ministry has moved a proposal to reduce excise duty on the two fuels as part of the pre-Budget memorandum submitted to the Finance Ministry. Since fuel prices are a politically sensitive issue the final call on cutting excise duty is expected to be taken by Finance Minister Arun Jaitley in consultation with the Prime Minister. Petroleum Secretary K D Tripathi had on Monday stated that the ministry has forwarded a set of recommendations for the budget but had refused to divulge details. The price of petrol on Tuesday shot up to Rs 72.38 a litre in Delhi while that of diesel rose to Rs 63.20 which is the highest level since March 2014. Prices have risen by Rs 3.31 per litre since mid-December. 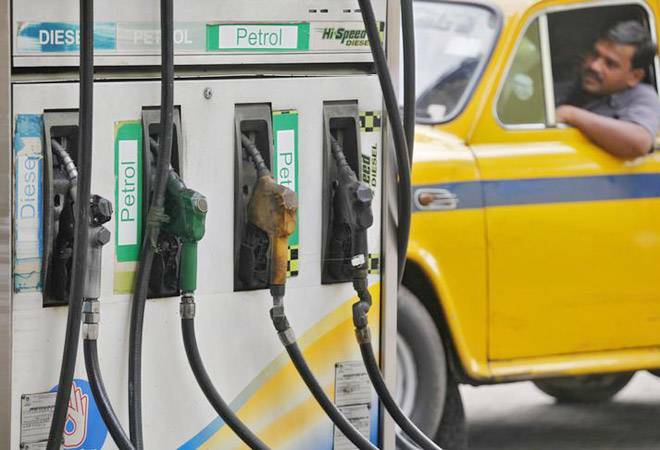 The oil companies raised the price of petrol by 15 paise per litre and that of diesel by 19 paise on Tuesday as part of their daily calibration with international markets. In Mumbai, the price of petrol has crossed Rs 80 per litre while diesel costs because of higher state levies such as VAT imposed on the fuels. Rising fuel prices impose a crushing burden on the the middle class and the politically crucial farm sector has also been impacted due to high diesel prices as tractors and irrigation pump sets use the fuel in large quantities. The central government levies Rs 19.48 per litre excise duty on petrol and Rs 15.33 on diesel. VAT on petrol in Delhi is Rs 15.39 per litre while on diesel it is Rs 9.32. The price of benchmark Brent crude in the international market on Tuesday rose to USD 69.41 per barrel which is close to a three-year high. The BJP-led NDA government had raised excise duty nine times between November 2014 and January 2016 to take advantage of falling crude prices to shore up public finances to fund social welfare schemes for the poor. The excise duty on petrol was hiked by Rs 11.77 per litre and that on diesel by 13.47 a litre in these 15 months which helped the government's excise mop-up to more than double to Rs 2,42,000 crore in 2016-17 from Rs 99,000 crore in 2014-15. The government has cut excise duty only once in October last year by Rs 2 per litre when the petrol price had reached Rs 70.88 per litre in Delhi and diesel was priced at Rs 59.14. Because of the excise duty cut, diesel prices had on October 4, 2017 come down to Rs 56.89 and petrol to Rs 68.38. However, subsequent rally has wiped away all the gains and prices have touched new highs. The October 2017 excise duty cut cost the government about Rs 13,000 crore in revenue for the remaining part of the current fiscal year that ends on March 31, 2018. State-owned oil companies in June last year dropped the 15-year old practice of revising rates on 1st and 16th of every month and instead adopted a dynamic daily price revision to instantly reflect changes in cost. Rates during the first fortnight starting June 16 dropped but have been on the rise since July 4. Since then prices are revised on daily basis. Budget 2018: Will the middle class get some relief in the upcoming budget?